Well we did get more rain and a lot more water, hoping they get the water back down to normal by the 4th. I know they are doing all they can with the water because down lake is a lot worse off then us. But a lot of local businesses are really hurting from all the high water keeping people away. A lot of businesses rely on the summer months to make it all year. A lot of people always make the comments that they will make it up…but you never do – once you loose out, there are not enough days in the summer to make it up. I have been in business for 20 years here on the lake and you never make it up you just loose out and that’s why I go south for the winter time to make it, so please help out your local Grand Lake businesses as much as you can. – Large mouth has been really good. The picture I have added is with Jeff Campbell when we had our best five fish at 22 lbs and had 36 fish for the day. That’s a good day anywhere and we only fished until noon. We caught them on jigs on the Elk River. T.C. 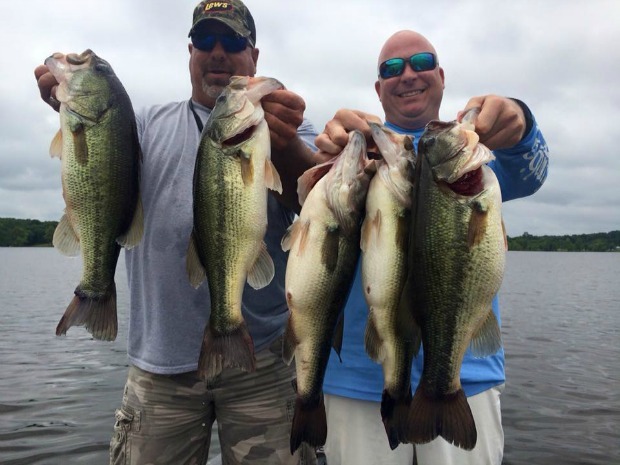 Grand special – it does work on Grand Lake, on points where the big gizzard shad have been. – White bass have been really good in Elk River area using silver rainbow minnow from Littlefield’s tackle. – Crappie been catching some around the bridges on jigs – Bobby Garland. And, the spoonbill are jumping everywhere so be careful. I’ve also been doing some filming with getalimitoutdoors.com on Facebook and YouTube. been a lot of fun so check it out. Until next time…Good Luck Fishing from Tony Coatney! PreviousA Grand Water Quality Camp Adventure!